Photo right: Willie Nelson (Rev. Andy Ray) and Elvis (Rev. Hal Hall) perform at Getwell UMC. On Sunday, Feb. 15, 2015, Getwell Road United Methodist Church hosted the DeSoto County Cluster Talent Show to raise mission funds for Stop Hunger Now and Camp Lake Stephens. It was amazing and inspiring to see and hear the talent in our DeSoto County churches that was given as an offering to the Lord's work. As a special feature, Willie Nelson (better known as Rev. 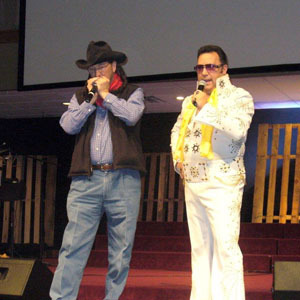 Andy Ray, district superintendent of the Senatobia District) and Elvis (also known as Rev. Hal Hall of Southaven First UMC) appeared onstage together for the first time. They were not contestants, but simply provided their music to give back to the Lord. These leaders, who faithfully witness of the goodness of the Lord through their sermons and their service to others, chose to do even more by sharing a powerful message in music. Often, music can reach into lives and hearts when nothing else can. Many of us who witnessed this awe-inspiring duo and hope that they will team up together in the future. Because of an incredible outpouring of love and support for the talent show competitors, we were all declared winners. Funds raised exceeded $3,000. There was such a warmth and welcome as we gathered for fellowship and friendly competition for the cause of missions. Donations for dessert items were still being made after the close of the program, and these additional funds will make it possible to accomplish even more through mission work. The talent show was a success in so many ways, but we must continue to support missions by giving back to the Lord. We will have opportunities to help pack meals through the Stop Hunger Now events, and we also must continue to support the vital ministry of Camp Lake Stephens. Let us prayerfully seek out God's mission for our lives.